That’s right kids – here is a brand new way of accurately nailing that most tricky of species, the ugly cousin of the Mauritius Solitaire – the Dodo. This is the kind of inside info that you cannot get in your Collins or Sibley. Bookmark it – tell your friends – this is important ok? Look, I know this is blog is advertised and probably derided in equal measure as a dodgy-patch-birding-blog, but it’s pretty quiet out there, and there is only so much distance I can get out of ‘I saw a Kestrel fly off’, ‘I saw some Wigeon yesterday’, or ‘my year list is nearly twenty’ – but I thought that this might be interesting, so here goes. 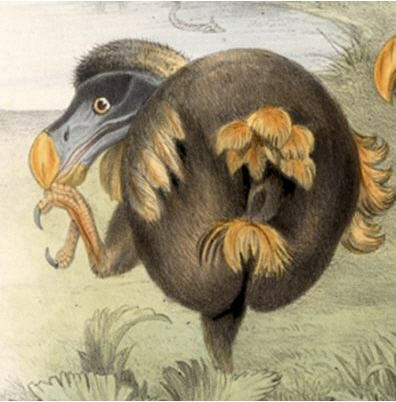 The Dodo – Raphus cucullatus. If someone you know has Dodo on their list, they probably have a half glimpse of a Slaty-backed on there in permanent marker. Or their name is Nebuchadnezzar. Either way, it is, as I am sure you know properly, properly very extinct indeed. No comeback tour for this 20kg mother. Not Slender-billed Curlew extinct either – this one will not be rediscovered by loads of birders having their holidays in Ulan Bator or somesuch. 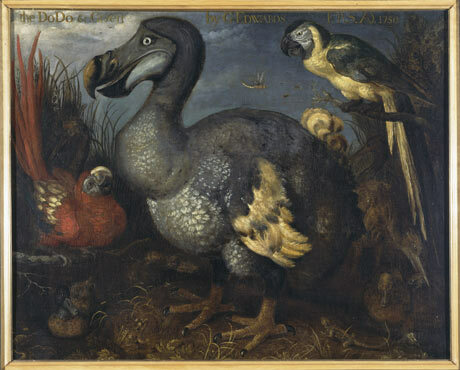 Anyway, here is the classic image of the Dodo painted by the esteemed Dutchman (I only want to help you) Roelandt Savery. The keen eyed super-birder will have noticed that the birds head is smaller, the body is less bulky, legs longer and neck straighter. The wings, which being a flightless bird are redundant, are more Penguin like or even Great Auk-ish. So next time that you are confronted with a strange looking Raphidae on your local rubbish tip, you know exactly what to look for. No, don’t thank me. I seek no praise for this – think of it as a kind of public service. By the way, despite the Dodo supposedly being eaten to death by sailors, it tasted ‘orrible. And Savery painted a picture of it’s arse for some strange reason. Perspective I guess. More Julian Hume Dodo stuff can be accessed by clicking your mouse on these words. 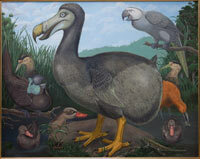 This entry was posted in art, birds, dodo, history, news, ornithology and tagged art, birds by Thing. Bookmark the permalink.